1. Brush the vinegar onto the brisket, make sure to cover the whole brisket. Let the brisket sit with the vinegar on it for about an hour. 2. Combine all the seasonings in a bowl and mix well then add the apple juice and stir well. 3. Using your hands spread the seasoning mix onto the brisket. It should be wet enough to stick well but not be soupy. Make sure the whole brisket is evenly covered in the seasoning. Refrigerate uncovered for about 24 hours. 4. Bring the smoker to between 200º-250º F. Place the brisket in the middle of the smoker. Let it smoke from 10-16 hours. If you can't have it on the smoker that long you can remove it after 5-6 hours, wrap it tightly in aluminum foil and put in a standard oven for the remainder of the time. If you’ve ever had a well made brisket it is an experience that will stand out in your memory for years. Unfortunately we’ve all had a brisket that wasn’t so well made. This recipe will give you great results, with the most important ingredient, besides the brisket, being time. 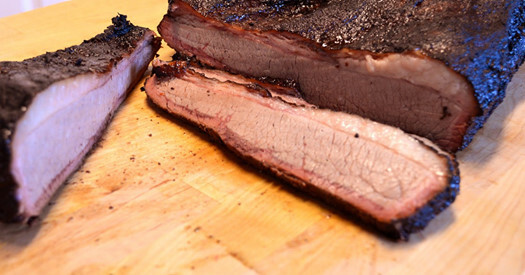 Without sufficient cooking time your brisket will come out tough and no fun to eat, no matter how you season it. The brisket comes from the chest of the cow and is a muscle that gets used every time the cow takes a step. It even is in a state of tension just from the cow standing still. All that flexing results in a cut of meat that is very tough. That also means that there is a lot of flavor that can be unlocked. The way to soften it up and bring out the flavor is a low temperature cooking marathon. Of course there are some tricks you can do to make this all go better or a little bit faster. The first tip is to brush some vinegar on the surface and let it sit for little bit. I prefer apple vinegar for it’s flavor but any vinegar will do the job. The reason you brush the brisket with vinegar is because vinegar helps break down the proteins that make the meat stiff or hard. The vinegar isn’t going to be able to soak all the way through and make it all soft and mushy to the core. This step will only effect, at most, the outside 1/4″ and that’s ok because the only reason we’re doing this step is because it gives the seasoning a place to work their way in. If you look carefully at the picture above you’ll notice a ring of extra red right around the outside of each slice. That ring is called the bark and that shows you where the seasonings have penetrated and added flavor. Brushing vinegar over the surface before seasoning helps lay the groundwork for the bark. The next thing we do to help make the meat more tender is we add salt to the seasoning. Salt also helps tenderize in much the same way as vinegar. Salt will react with the proteins to loosen the connective tissue that makes the brisket tough. Salt can do great things on it’s own but without the slow heat to aid it, the meat just won’t get soft. Cooking it at around 225º will finish breaking down all that tough connective tissue in the brisket. Smoking helps add even more flavor and helps build the bark which traps the juices inside and makes all the magic happen. You can cook a brisket in the oven for the whole time, it just won’t have that great smoked flavor. Frankly, if you’re going to go through the trouble of making a brisket and invest all the time, you really should be doing it right though. But if you don’t have a smoker and really want to try this, you’re oven will do a passable job. Right around the 6 hour mark you’re brisket will seem to stop cooking. When you check the temperature inside the brisket you won’t see it rising anymore. The alarming thing about this is that it won’t be at a high enough temperature to make it safe to eat much less to cause the meat to get tender. This is called “the stall” and this is what separates the boys from the men. The boys panic and crank up the heat and end up burning the outside of their brisket. The stall happens because the cooling effect of evaporation counteracts the heat coming from your fire. At the temperatures you’re using it will take some time to let the moisture work it’s way out enough so that eventually there isn’t as much evaporation and the heat can start penetrating further. The best course of action is to keep it in the smoker but if that isn’t a viable option for you, then you can “cheat”. Wrap the brisket tightly in multiple layers of aluminum foil and put it in a conventional oven for the remainder of the time. If it’s been on the smoker for 5-6 hours, you can transfer it to the oven in this manner and cook it for only another 2-3 hours to get a tender brisket, but I would suggest doing this only if you’re in a time crunch for serving it. Once it’s done it will be almost buttery in it’s texture and loaded with flavor.